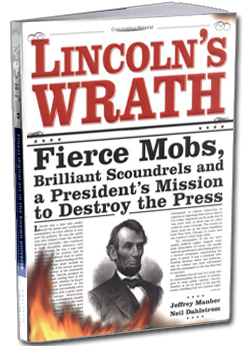 Written with Niel Dahlstrom, Lincoln’s Wrath is a classic Washington whodunit, a story of mystery, of greed, of power gone amuck. That it took place during the Civil War and involves a president of the United States named Abraham Lincoln, only adds to the intrigue. At the start of the Civil War pro-southern editors and writers like John Hodgson of West Chester, Pennsylvania took on the early actions of the Lincoln administration. For them, the Southern states had every right to invoke succession. States rights were paramount to national government, just as Thomas Jefferson had long ago preached. If South Carolina wanted out of the Union, let it go. There were dozens of anti-war newspapers throughout the northern states which brazenly took on the new president and his war policy. There was little fear of course, as freedom of speech is a basic right under our Constitution. But Lincoln, as the men would soon learn, was playing by a new set of rules. On August 19th, 1861, John Hodgson’s newspaper office was broken into and all equipment destroyed. It seemed clear that this outspoken editor would never be able to publish his beloved Jeffersonian again. Who ordered the newspaper destroyed? If there were eyewitnesses that evening, no one was talking. After all, Hodgson’s Jeffersonian was an eyesore to the town of West Chester. Each week Hodgson’s editorials threw barbed criticisms of the Civil War and towards Lincoln personally. He wrote colorfully against those who swarmed around the president, calling them sycophants and pimps. His editorials are works of art, sparing no politician of his sarcasms and insights. It was difficult on one level for us to have sympathy for John Hodgson and his Jeffersonian newspaper. Yet we have also grown to admire this man, who picked up the pieces of his destroyed newspaper and prepared to resume publishing; risking the violence of the mob. Then an extraordinary event took place. On Friday afternoon, August 23, 1861, the Jeffersonian was closed not by an angry mob but by the appearance of two federal marshals, acting on orders, they said, from the President of the United States. Now the story moves to another level. Of break-ins and cover-ups. 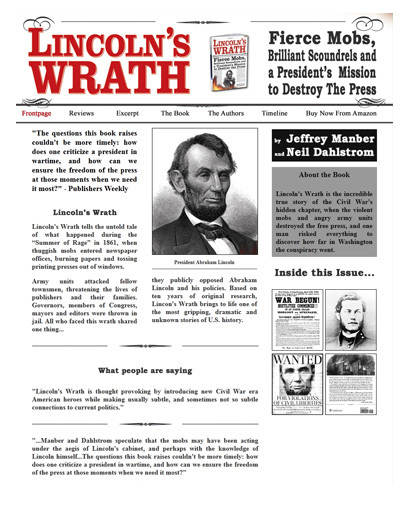 Did Abraham Lincoln really order his operatives to shut down this anti-war newspaper? And, if not Lincoln, were those in power really concerned about what John Hodgson was saying? This is the true story of a forgotten battle of the Civil War; one which pitted anti-war Northerners against the power of the mighty Lincoln Administration. It is the recounting of the “Summer of Rage,” when in 1861 the Republicans around Lincoln systemically shut down all dissenting voices. Editors and writers of anti-war newspapers were subjected to a myriad of punishments. Some were tarred and feathered, some thrown into federal prisons, held without trial for months at a time. Their only crime seemingly that of speaking out against the Lincoln Administration. Others were forced to change their opinions and publish only glowing praise of government’s actions. On one level this is the story of an angry, emotional, colorful and stubborn bigot who was also a passionate believer in freedom of the press. He took on an American icon named Lincoln because of his belief in the Constitutional right to a free press. Yet it is also a window into the actions of the Lincoln’s Administration as it tore up the basic rights of dissenting Americans in the name of preserving the Union. And it is the surprising new look at the great Lincoln as a politician extremely sophisticated at the use of the media. We believe he was our first “media” president in adroitly manipulating the press and public opinion. The elasticity of the constitution in a time of unparalleled threats is the very issue confronting us again today. How far can we go in criticizing a president during a national crisis? Is it an unlimited right no matter the circumstances? Attorney General Bates declared the newspaper closings constitutional. The New York Times was supportive, writing that “speech is only free when loyal.” Patriotism was the law of the day and preservation of the Union the end that justified the means. But this is a Washington story, and we learned nothing was as simple as it first seemed. We believe politicians around Lincoln used the Summer of Rage to settle old scores and tried to bring about a golden era of political patronage, one in which the plume government positions would have forever been the domain of Lincoln and his allies. John Hodgson, almost alone among the anti-war editors, fought back. He had the audacity to sue the Lincoln administration and in a Philadelphia courtroom in the winter of 1863 a judge named Walter Lowrie pronounced even the president of the United States under the laws of the constitution. For ten years we have read these anti-war newspapers, poured through the personal diaries and letters of a forgotten generation of editors, writers and publishers. We have come to feel their fear of taking on an administration in the midst of the Civil War, and their anger that the Constitution was being trampled. We have found ourselves disagreeing as to whether the draconian actions of Lincoln and his administration in muzzling dissenting voices were justified. Perhaps it is right that two historians cannot agree, for the role of the Constitution in a crisis is a basic American dilemma. Is the Constitution only to be obeyed during times of national peace? Hodgson thought not, and perhaps we are a stronger nation today because of the personal courage of these Civil War-era editors.